On Monday, The Washington Examiner posted an article about the Democrats’ calls to make the entire Mueller Report public, including source information, Grand Jury testimony, etc. Well, there are some pretty strict rules protecting the secrecy of Grand Jury testimony, and it is quite possible that disclosing other information could be a problem for our intelligence services (and possibly some foreign intelligence services). It should be noted that in their calls for transparency I haven’t heard them ask that the FISA warrants and background information on those warrants be made public. However, this call for transparency on the part of the Democrats is an interesting contrast to their reactions to previous Special Counsel reports. Rep. Jerrold Nadler, D-N.Y., chairman of the House Judiciary Committee, is the leading Democrat demanding the release of the Mueller Report “in its entirety” without redactions. His committee is planning to subpoena the Justice Department for the full report. What Nadler, 71, said in 1998 echoes what Attorney General William Barr told Congress last week. Barr, 68, wrote that he might redact grand jury testimony, information related to ongoing investigations, sensitive or classified information, and “information that would unduly infringe on the personal privacy and reputational interests of peripheral third parties” from the report that he provides to Congress and the public. Representative Nadler does not want the entire report made public–he wants the Democrats to get the entire report so that they can leak misleading parts of the report and make the scandal last until the 2020 election. The is a political game. Special counsel Mueller declined to charge anyone associated with the Trump campaign of coordination with the Russians, but did not reach a decision on obstruction. Attorney General Barr and Deputy Attorney General Rod Rosenstein concluded that Trump had not obstructed justice. How can you have obstruction when there was no crime? Hasn’t Anyone Read The U.S. Constitution? Yesterday The New York Times posted an op-ed piece titled, “The Inevitability of Impeachment” by Elizabeth Drew. It is an opinion piece, so I guess facts don’t really matter, but it is still an amazing work of fiction. An impeachment process against President Trump now seems inescapable. Unless the president resigns, the pressure by the public on the Democratic leaders to begin an impeachment process next year will only increase. Too many people think in terms of stasis: How things are is how they will remain. They don’t take into account that opinion moves with events. Whether or not there’s already enough evidence to impeach Mr. Trump — I think there is — we will learn what the special counsel, Robert Mueller, has found, even if his investigation is cut short. I can see the talking point already–if the House begins impeachment proceedings and the Mueller investigation is ended because of that, the cry will be that he would have found something if he had had more time. The man has been supposedly looking for Russian collusion for two years at taxpayers’ expense and so far all he has come up with is a legal contract asking someone to remain silent. The word “impeachment” has been thrown around with abandon. The frivolous impeachment of President Bill Clinton helped to define it as a form of political revenge. But it is far more important and serious than that: It has a critical role in the functioning of our democracy. Impeachment was the founders’ method of holding a president accountable between elections. Determined to avoid setting up a king in all but name, they put the decision about whether a president should be allowed to continue to serve in the hands of the representatives of the people who elected him. So the impeachment of Bill Clinton was frivolous even when he lied to a Grand Jury and tried to influence others to do the same, but the impeachment of Donald Trump would not be frivolous. Wow. Please explain the logic here. It always seemed to me that Mr. Trump’s turbulent presidency was unsustainable and that key Republicans would eventually decide that he had become too great a burden to the party or too great a danger to the country. That time may have arrived. In the end the Republicans will opt for their own political survival. Almost from the outset some Senate Republicans have speculated on how long his presidency would last. Some surely noticed that his base didn’t prevail in the midterms. But it may well not come to a vote in the Senate. Facing an assortment of unpalatable possibilities, including being indicted after he leaves office, Mr. Trump will be looking for a way out. It’s to be recalled that Mr. Nixon resigned without having been impeached or convicted. The House was clearly going to approve articles of impeachment against him, and he’d been warned by senior Republicans that his support in the Senate had collapsed. Mr. Trump could well exhibit a similar instinct for self-preservation. But like Mr. Nixon, Mr. Trump will want future legal protection. Mr. Nixon was pardoned by President Gerald Ford, and despite suspicions, no evidence has ever surfaced that the fix was in. While Mr. Trump’s case is more complex than Mr. Nixon’s, the evident dangers of keeping an out-of-control president in office might well impel politicians in both parties, not without controversy, to want to make a deal to get him out of there. As far as anyone knows, that standard has not been met. You can’t impeach a President just because you don’t like him or you are mad because your candidate did not win the election. 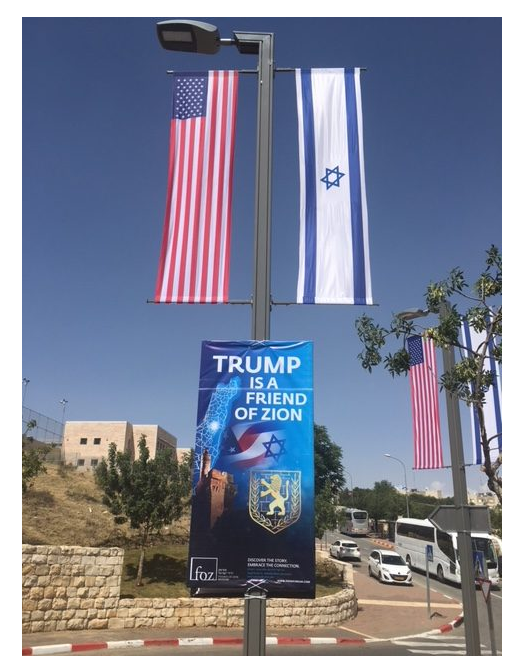 This are two pictures from Israel today as America opens its Embassy in Jerusalem. Ten days before he was assassinated in Tel Aviv, Israeli prime minister Yitzhak Rabin gave a speech in Washington about the city of Jerusalem. “Jerusalem is the heart of the Jewish people and a deep source of our pride,” Rabin said at an event recognizing the 3,000th year of the city’s existence. That speech was given Oct. 25, 1995. On Nov. 4, a far-right student fatally shot him. Every President since Clinton has taken advantage of that waiver to avoid moving the Embassy. Why? Because up until now America has been almost totally dependent on Arab countries in the Middle East for our energy supply. Now that we are on the road to energy independence, we are free to make decisions on the basis of what is right rather than how much oil we need. 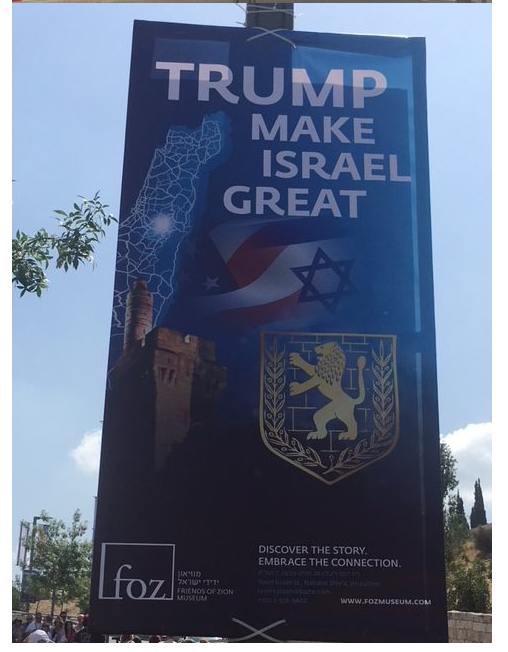 Thank you, President Trump, for having the courage to move the Embassy. I will confess that I did not watch the entire Republican debate. I don’t deal well with cage fights. However, I did see the part of the debate where Donald Trump attacked Jeb Bush for the actions of George W. Bush in Iraq. Aside from the fact that it was totally tacky to attack George Bush on his brother’s record, all of the charges made were simply false. Donald Trump seems to have forgotten that there were a number of reasons why we went into Iraq. Saddam Hussein was consistently violating a United Nations established no-fly zone–therefore, the credibility of the UN was at stake (I would just as soon get rid of the UN, but that was the situation). Saddam Hussein had already used poison gas on the Kurds (WMD). Saddam Hussein had previously fought with Iran and invaded Kuwait, and was not a stabilizing force in the region, and Saddam Hussein was training terrorists (google the airliner frame that was used to practice hijackings). In 2006, Fox News posted a story about the discovery of WMD’s in Iraq. The Bush White House decided not to make a big deal of the discovery. I think this was a mistake, but you can follow the link to read the article. Yesterday The Washington Times posted an article that sheds some light on the fact that we were not ready for 9/11. As Republican presidential candidate Donald Trump hammers away at former President George W. Bush for not stopping the September 11 attacks, another factor could be added to the debate: Mr. Bush inherited from Bill Clinton an intelligence community in terrible shape. This fact comes not from a Republican partisan but from George Tenet, President Clinton’s CIA director, a post that at the time made him the country’s top intelligence officer. …In addition to Mr. Tenet’s book, other intelligence sources have told The Washington Times that the CIA in the 1990s dramatic cut the number of case officers — the people who recruit spies — from 1,600 to 1,200. The CIA closed operating bases, even the one in Hamburg, Germany, where September 11 Islamists plotted the attack. The NSA, the nation’s listening post, was not keeping up with the Internet revolution and was stymied at times by cell phone technology. Mr. Bush reversed that trend by pouring billions of dollars into the CIA to hire new officers and into the NSA to set up new technology development units. Mr. Tenet wrote that he personally asked President Clinton for billions more, but received no increase. The Senate Select Committee on Intelligence and a special blue-ribbon panel looked into the claim, and both unanimously concluded the WMD finding was solely the product of the intelligence community, free of White House interference. Neither Mr. Bush nor the CIA lied, the panels said. So I have a few questions about this attack. Why was Donald Trump spouting Democratic talking points? He also failed to mention that because of the actions of Al Gore and Bill Clinton, President Bush was not able to put his security team in place in a timely manner–his election was declared later than usual and he was delayed in putting his people in place. Donald Trump also failed to mention that Iraq was on its way to being a stable ally before President Obama prematurely withdrew his troops. I am not a supporter of Jeb Bush, and I believe that his response to this attack was totally ineffective, but the attack was totally out of line and inappropriate. If I were a supporter of Donald Trump (which I am not) his actions during this debate would cause me to reconsider.